Serious fisherman choose this lure time & time again because it catches fish. Joe’s built in kee.. The Buchertail 501 Tinsel is built on a new concept focused on making a downsized version of the pop..
One of the best selling bucktails is available in flashy tinsel. Built with the same rugged componen.. The TinBuck combines the perfect balance of original 700 Series Buchertail and the flashy skirt of t..
Joe Bucher successfully hybridized the original Buchertail 700 by blending the flash of tinsel Flash.. Very limited quantities! The Boo Dadley was created out of necessity in 2006. Designed with Giant M..
Ghosttail 100 Series is a shallow running bucktail which is evenly balanced and easy to cast. It is ..
Just like all other Ghosttails, the Ghosttails 700 Series is tied by hand. They are tied with a uniq.. The Ghosttail 800 Series can be used as a burner or for fishing deeper. They are tied with a unique .. Here is the release of our NEW patent pending Revolution Bucktail. We went back to the drawing board..
* .045 Diameter Stainless Wire * Double #8 Colorado Blades (sometimes called short mag ..
* .045 Diameter Stainless Wire * Single #8 Colorado Blade (sometimes called short mag 8..
* .051 Diameter Stainless Wire * Double Magnum #8 Colorado Blades - .025 thickness * ..
* .051 Diameter Stainless Wire * Double Magnum #10 Colorado Blades - .025 thickness *..
* .051 Diameter Stainless Wire * Double Magnum #12 Colorado Blades: .025 thickness * .. Here is the new for 2016 KBT Front End Loader Windowmaker! With its weighted design, it is.. These compact musky & pike bucktails are all hand tied and made from the finest materials availa..
A great choice for clear water scenarios, the S-8 is a premium bucktail known for calling in muskies.. This model is designed to use in low-light situations and in stained water where muskies need to key.. These marabou DC-8’s are all hand tied and made from the finest materials available on the mark.. The DC-9 consists of two magnum #9 blades that put off a great amount of vibration. This lure is gre.. These marabou DC-9’s are all hand tied and made from the finest materials available on the mark..
Our Custom "2 in 1" Clevis is the key feature on our Apache Double Blade Bucktails. Not only d.. The “Apache” Triple Blade Bucktail...and the Triple Blade Revolution Begins The “Apache” Triple .. The same concept as the Showgirl just a step up. Durability, underwater vibration and light gatherin.. The JR Double Cowgirl is sure to be a big fish lure just like the Double Cowgirl. Only half an inch .. The Double Cowgirl is already a classic big fish lure. It is truly something different for in-line s.. Bigger than the rest the Super Model Double Cowgirl is a real trophy getter! This bucktail will wake..
Twin #4.5 Colorado blades on this bite size Micro Double Cowgirl. 5", 0.7 oz.. Innovative, light gathering, breathable inline spinners. The bait that has allowed everyone in the f.. When light hits the blades of a Livewire it is reflected back in multiple directions due to the retr.. The NEW 10-9 Combo is now available. The .040 thick magnum #10 blade and the .025 thick magnum #9 bl.. Bigger than the rest, the Super Model Double Cowgirl is a real trophy getter! This bucktail will wak.. Sister to the "Double Cowgirl" this double bladed marabou is a top producer just like the rest of th..
Musky Mayhem's Electric Bunny is a marabou and flashabou mix with double magnum ..
Musky Mayhem's Big Bird is a marabou and flashabou mix with double 13 blades. They have a salt .. The Junior Trolling Girl from Musky Mayhem is a mini version of the original Trolling Girl, specific.. 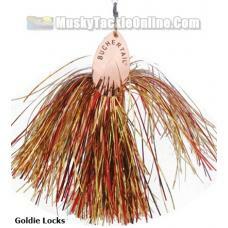 This new bucktail from Musky Mayhem is specifically designed for trolling. Beefed up wire, beefed up..
7 1/2", 1.2 oz. #6 Fluted Indiana Blade.. Originally hand tied and assembled by George Wahl of Wahl Tackle Company. 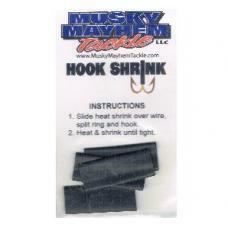 These baits are extremely ..
A 4 pack of Musky Mayhem's shrink tube. Perfect for when you need to replace hooks on your Musky May.. The Marabou Flasher features two #8 Colorado blades in front of a pulsating marabou and flashab..